In lightly-loaded mechanisms I have traditionally used 80DP belts and pulleys with good result. But this thing will need to withstand machining forces and will be very low speed (quasi-static) vs. power drives that GT2 is aimed at. Thank you for making me dig deeper! HIYA RANDY we put a little more load on the systems than a 4th drive would. OVER 20 hp and 13000 rpm shaft speeds (;-) Have not broken a belt yet BUT have stripped our fair share of teeth off the belts over the years. You used to be able to get the tooth design drawings from GATES. I have the 8mm series of the HTD. BUT they hold the new GT2 series TIGHT and you have to KNOW someone to get a copy to cut a new set OR LEASE/BUY the hobbs from GATES(;-). WHAT you see in the latest CAD drawings is a generic profile. Ah, but that's where the patent I linked earlier comes in. They show the dimensions for an 8mm pitch belt tooth and pulley groove, and you can get the other sizes just by ratioing the pitch. I drew up a 90-groove 5mm pulley last night. Just for educational purpose to verify their numbers, of course. I wouldn't even think of attaching a DXF--given the patent situation that's something you'll need to draw in the privacy of your own house. 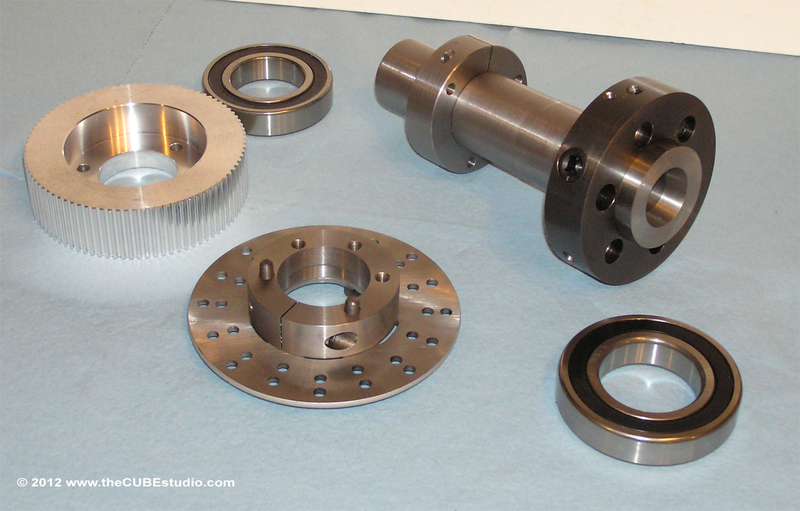 To complete the design reference, http://www.sdp-si.com/D265/PDF/D265T016.pdf gives pulley O.D. 's for the various belt types and sizes up to crazy groove numbers. Those O.D. 's and the above-referenced patent give all the information needed to draw up any GT2 pulley you need. Unfortunately I do not have time to really read the entire thread at this time, but in skimming, I found a couple of items that I may be able to clarify. 1) Bearings side loading: I also spoke to SKF engineering long ago and got the OK and the specs to preload their deep groove precision plus bearings. This makes something of a 'po boy' angular contact bearing although you benefit only from the zero backlash and do not get additional precision. In fact, the lack of precision can cause slight 'tight spots' in the rotation which would not be present in preloaded ABEC7 bearings. 2) There was mention of bearing install specs. This is a valid discussion, but the large OD of the 5C spindle results in such a friggin huge bearing, only the alignment spec (which is pretty wide, especially for the typical C3) really needs to be considered. If you have a 4,000lb armature spinning on these size bearings (a more appropriate use) then heat transfer and so on become important considerations. I am now completing an all new prototype 4th axis which will have for the first time a precision option with ABEC7 AC bearings. To meet that spec, the assembled frame will be line bored. I am going to do them all that way, but it is not needed for the deep groove ball bearings. 3) Belt Type: Technically, the trapezoid form is tighter and is still 'good practice' spec for positioning as was mentioned in this thread. How . . ever, other than being an easy tooth form to make pulleys for, it has nothing else going for it. They are very noisy and have far less power capacity that HTD or GT. Part of the good positioning performance comes from the tension spec, which is sort of 'cheating' in my view. There is a 'secret' to tightening up the GT that I will share here for the first time; cut the teeth a little bit (the spec I will not share) shallow. This compresses the teeth into the groves and eliminates the tiny amount of backlash that is intentionally built into the form. You can probably duplicate this effect in an of-the-shelf pulley by machining a very small amount from the tops of the teeth. Since this is likely to reduce the overall belt life, I am not recommending it . . . . I'm just saying . . .